There are very few boat dealers with a more tempting playground on their doorstep than the Wolf Rock Boat Company. Perched down in Salcombe among some of the most beautiful cruising grounds in the world, they enjoy exactly the kind of sheltered estuary charms and extraordinarily untamed open seascapes that might draw the tentative novice into a lifelong love affair with boats. Small wonder, then, that the company’s remarkably affordable fleet of Brig RIBs appears so popular on the local waters. Designed and built in Ukraine by a team of ex-military aeronautical engineers, there are three lines in the Brig range. 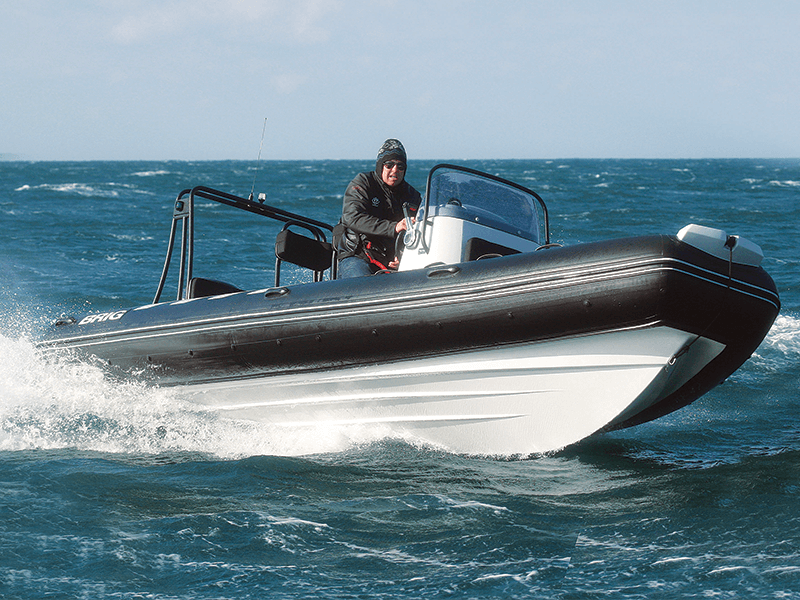 The entry-level Falcon line comes either as a hard-hulled tender (from 2.75 to 3.6 metres) or as a more spacious rider (from 4.0 to 5.7 metres); the Eagle line offers more luxurious, higher-spec water sports RIBs from 3.4 to 7.8 metres in length; and the Navigator fleet is the newest of the lot. Based on the established hull and tube shapes of the Falcon range, the Navigator line has recently expanded its offering to three craft – the 570, the 610 and the 700 – and according to Brig, they are all ‘designed and built as a crossover concept that appeals to those who want to challenge the elements’. In fact, with their reinforced hulls and jockey-style seating configurations, it would appear that the Navigator is Brig’s attempt at an all-action plaything for precisely the kinds of open waters so richly available in and around south Devon. This might be Brig’s tough-guy line, but let’s start off with the aesthetics, which are indisputably attractive. The tubes, seat cushions, screen rim, grab rails and splendidly curved aft arch conspire to generate a muted, matt-black contrast to the glistening white of the hull and deck that looks fantastic. There are also neat little stylistic flourishes, such as on the elegant swept support bars for the backrest of the aft bench, where it would have been much easier to use simple, vertical uprights. Brig have plainly worked very hard to make the Navigator look dynamic, and their efforts have paid off. In terms of the layout, the deck is dominated on this test boat by the seating. That sees the helm console positioned a fair way forward and offset to starboard, generating a decent port space to access the bow and also producing sufficient capacity aft for the inclusion of a full-beam bench and two pairs of jockey seats. This is the natural default setting on a sporting RIB, partly because of the perennially tight internal beam and partly because those in pursuit of a lively and interactive drive tend to favour either a leaning post or the semi-standing straddle position. However, despite the evident attention lavished on the aft space, the little bow also works pretty hard. For a start, you get a proper metal screen rim that is separated from the screen itself with sufficient space to get your fist around it unhindered, so you can access the bow deck in a rocking boat without concern or difficulty. Once there, you get the customary seat inset into the front of the console moulding, plus four tube-top grab handles on either side. In the V of the bow, the anchor locker is topped off by a small one-man aft-facing cushion and equipped with a solid GRP tube-top moulding for faster, more secure seamanship duties. It’s all very neatly done, and if you buy the optional sun deck pack, you also get an infill for lounging in the bow – a very welcome asset on a small family boat with a fixed bench and a deck full of immovable jockey seats. The bulk of the smaller details are also quite well attended to on the 610. For instance, back aft, the steel arch sees the nav lights tidily integrated into the structure, in full view of other water users but well out of the way of the boat’s occupants. Beneath the bench, the battery box is firmly strapped into position on the starboard side, leaving some decent space for storage. And while some may favour a central helm on a small RIB, here, the use of an offset helm and a right-handed throttle means that the lever is tucked well out of the way of an accidental knock from a curious child or a passer-by. Get underway and the forward position of that helm immediately makes itself felt. It all starts with a remarkably flat and rapid rise onto the plane, which is followed as you increase in pace and begin to negotiate the wave shapes by a very pleasant sensation that you are right up close to the point of action. This can be just as attractive for the keen driver as it is for the novice – and yet in fairly classic Brig style, it does appear to contribute to the boat’s tendency to keep the nose relatively low through the chop. Now plainly that’s great in a head sea and very reassuring in the turn, but you do get an inevitable bit of carving with the bow as you run down the swells with a following sea. As regards the engine choice, Brig quote a recommended range from 75 to 150 hp, but you would certainly want to pick an engine toward the top end of this spectrum. On the day, our test boat is rigged with Suzuki’s DF140 and it does a fine job, with rapid response and a top end of 36 knots – which (while quite modest) is perfectly adequate for everything most family boaters would want to achieve. Of course, Suzuki’s DF150, with its 2867cc block and its catalogue of clever technological buzzwords, might be fresher and more newsworthy than the faithful old DF140, but I’ve personally owned a 140 in the past and I have nothing but praise for it. If you’re in any doubt, you could also take a look at the E-Tec range, but for me, the fact that the DF140 is around 50kg lighter and £1,200 cheaper than the DF150 makes it a very simple decision. Just one thing. This boat comes equipped as standard with a water sports tow eye (and its performance could certainly cope with the acceleration and speeds required for any kind of pastime short of barefooting) – but if you want to use it for water sports, you should invest in a better means of reboarding. As things stand, there’s no ladder at either bow or stern, and Brig’s trademark steps in the aft ends of the collar are peculiarly absent on this latest model. More to the point, with fat tubes of 50cm, a relatively narrow beam of 2.3m and an outboard at the upper end of the power spectrum, there’s not a lot of space on and around the transom for swimmers – so one of those ingeniously curved, tube-mounted RIB ladders would be a very useful aftermarket addition. It’s important to get this new boat into its proper perspective. Though it is designed and rigged as a more adventurous craft than those in Brig’s other two lines, it remains a Category C boat for coastal passages and moderate seas. Used in that way, it is a perfectly likable RIB with considerably more to it than aesthetic appeal. However, with a base price of around £25,000 for the 90hp package, the standard features list does need supplementing with optional extras. For instance, you might want to set aside some extra money for a trailer and a DF140. You might also want to consider hydraulic steering, a set of sun deck cushions, and of course a compass. Naturally enough, these ‘extras’ will inflate the price, but however you choose to configure it, the Navigator 610 remains a soundly conceived and remarkably affordable family package.